I've been a lazy blogger, neglecting to post this year's list of books to read BEFORE you see the movie. If you checked out my page: Books to Read BEFORE you see the movie 2013 there were a measly couple of entries. BUT I've been busy playing catch up and am three quarters of the way through updating the list so take a look here to see what's up next. While release dates are subject to change without notice I'll continue to update the list when I get new info. As always, some of these films are in limited release and may not make it to a theater near you. They will, however, all be available on DVD, BluRay, video on demand, HuluPlus, NetFlix etc etc one day. The list is definitely a work in progress and I may have failed to turn up a few, but so far I'm excited to see The Great Gatsby, What Maisie Knew and The Spectacular Now. How about you? I saw the preview at the theatre for this movie, and I can't wait to see it. It looks fabulous. I'm especially interested because -- I've read the book -- and at the TIME I read the book, I did not really get the full import of it. So I want to see the movie, then re-read the book. It turns out that I rely on you for almost all of my books-into-movies news. So I'll just say that I'm excited about whatver you're excited about. Hello, just found you on Book Blogs. 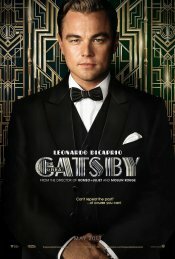 I'm also very excited to see The Great Gatsby.